Max Holloway sounded tired. And he had every right to. The UFC featherweight champ was enjoying Easter when he got the call from manager Brian Butler, wondering if he was interested in a fight with Khabib Nurmagomedov for the lightweight title. In six days. With no training camp and a long flight from Hawaii to New York and a vicious weight cut to make it to 155 pounds ahead of him. So, of course, Holloway was interested. If you ask him today, Holloway will insist that he would have made 155 pounds on April 6. But as he closed in on the championship weight on that Friday morning, he was deemed medically unfit to continue cutting, and his chance to make history as only the second fighter to hold two UFC titles simultaneously was over for the moment. It was a crushing blow, one seemingly made a little easier to take by the announcement that he will defend his 145-pound crown against number one contender Brian Ortega at UFC 226 in Las Vegas on July 7. Tickets go on sale this week for Holloway’s bout on what he likes to refer to as Hawaii’s “Ninth Island” in the fight capital of the world. And it’s a fight that will be as eagerly anticipated as that night’s main event between Stipe Miocic and Daniel Cormier, as it pits a champion on a 12-fight winning streak against an unbeaten challenger who many see as the future of the sport. 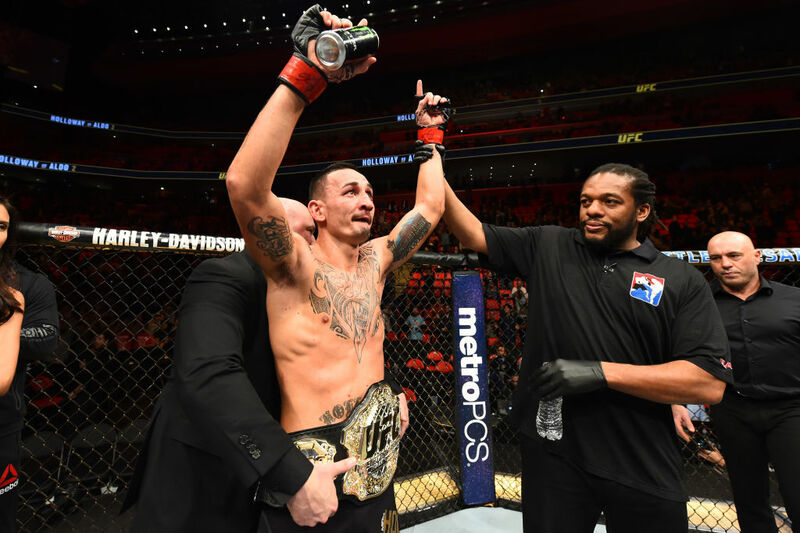 But Holloway wants to make it clear that he is the present, but before that happens, it’s important to look back at the recent past, more specifically, that fight week in Brooklyn. Yeah, Holloway was tired, but that was the price to pay for glory. Not money, but glory. History. Legacy. Any word you want to use to say that there is a greater purpose for going through the blood, sweat and tears of the fight game than a paycheck. He’s on his way. It’s too early to put that title on anyone who is yet to reach his 30th birthday yet, but to know that he’s accomplished so much already at just 26 years old and is not close to being satisfied makes the odds of him joining the greats of the game one days pretty good. But it’s not just wins and losses that make a legend; it’s facing adversity, staring it down, and getting past it. Let’s face it, the odds weren’t with him against Nurmagomedov. He had the weight cut, the short notice and the idea of facing a swarming wrestler who would have a size and strength advantage on fight night. Holloway still took the fight, willing to roll the dice for a chance to do something his son would hear strangers talking about one day. It’s hard to capture that in words. In fact, none were really necessary or fitting to describe what Holloway was going to attempt. So, hearing the weariness in his voice on that Tuesday morning of the UFC 223 fight week, I promised him I’d get him off the phone quick. He appreciated it, and as we ended the interview, I got in the real question I wanted to ask. There’s no training camp, the weather in Brooklyn is far removed from that in Waianae, he’s got a lot of weight to cut, and he’s facing a monster a weight class higher than his. So when the Octagon door closes, does this just become a Hawaiian street fight? No tactics, no strategy, just scrap? Holloway didn’t get his chance on April 7. On July 7, he does. There’s another seemingly unstoppable force in front of him in Brian Ortega, and those are the fights that make it all worth it for a champion with the mindset of a hungry challenger.